What do crazy cat ladies, haggard airline travelers, insane people, and gardeners have in common? For them, today, March 17, should be a day of revelry and celebration. I’m not talking about St. Patrick’s Day. (Although I admit I simply can’t let mid-March pass without slamming back a cold green one.) 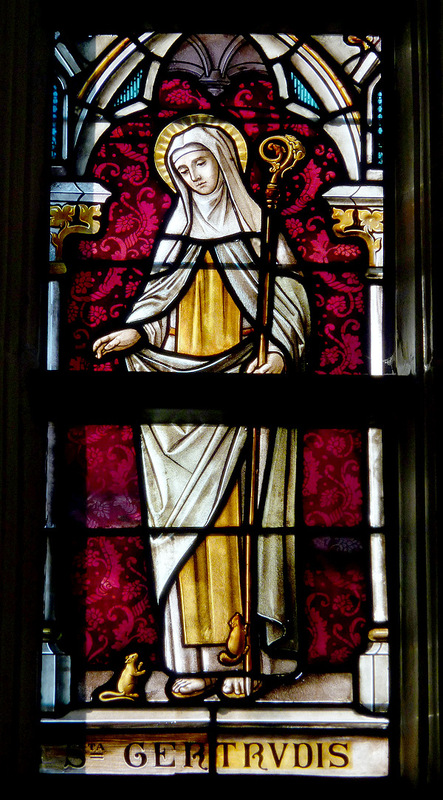 I’m talking about the feast day of St. Gertrude of Nivelles, who lived from 621 to 659. Two cats attempt to climb St. Gertrude in this stained glass window in the Belgian province of Limburg. Image by Wikimedia Commons / GFreihalter . Why, pray tell, would Catster readers be interested in St. Gertrude? March is Women’s History Month, and Gertrude is a strong historical figure. She’s the patron saint of gardeners, travelers, widows, recently deceased people, the sick, the poor, the mentally ill, and travelers in search of lodging. People call upon Gertrude for protection from mice and rats, fever, insanity, and mental illness. However, cat lovers revere Gertrude of Nivelles most of all. After all, gentle Gertrude is the patron saint of cats and cat lovers. Who says saints aren’t cool? How did St. Gertrude Get to Be Associated With Cats? 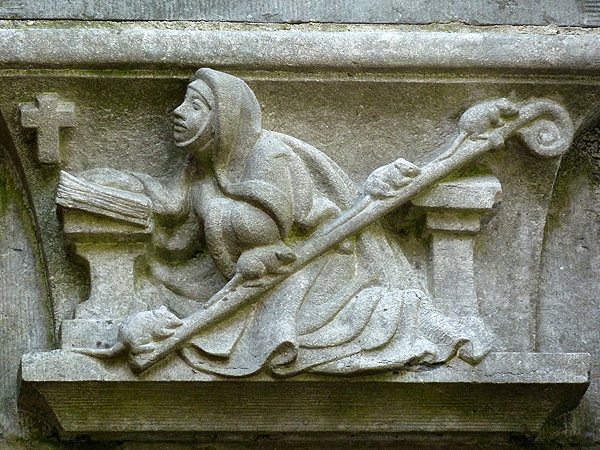 St. Gertrude is depicted in a stone relief on a canal known as Oudegracht in the Dutch city of Utrecht. Photo by Kattenkruid. Other accounts say she prayed for the mice to go away and they did. Because of the great mouse exodus, people referred to her as the patroness of cat lovers. She is often depicted with a cat near her or with mice running up her staff. The mice in her icons are said to represent souls trapped in Purgatory, whom she diligently prayed for. And we ailurophiles know that cats and mice go together like saints and heaven. 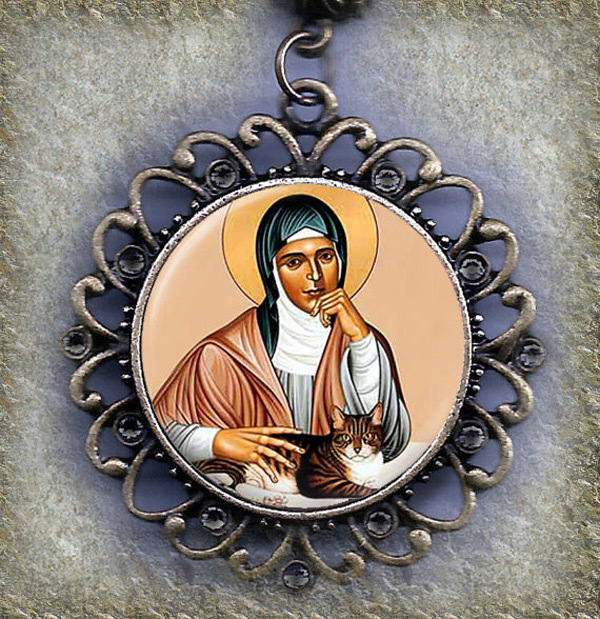 St. Gertrude pets a cat in this necklace by Etsy artist MarysPrayers. Because Gertrude is called upon to help travelers, that also makes her the super patron saint of people who travel with cats. She’s certainly the name to invoke when approaching airport security carrying a feline. As someone who has had to walk through an airport metal detector with a struggling cat in my arms, I called for help from everyone I could think of. I certainly got no assistance from the Transportation Security Administration agent who was smacking her gum, primping her hair, and gossiping with her security company buddy rather than helping me return my razor-footed feline to her carrier. Unlike other federal departments, the TSA must not consider blood a hazardous substance, because the guard seemed unconcerned by the red droplets of hemoglobin that traced my steps like Hansel and Gretel’s glowing stones. In one legend, Gertrude promised a group of travelers that they would arrive safely from their ocean voyage. At sea, a large sea monster threatened to capsize their ship, but it fled when the pilgrims called upon St. Gertrude for protection. Because of her influence with the Almighty, perhaps she could intercede with the TSA on behalf airline travelers bearing cats. 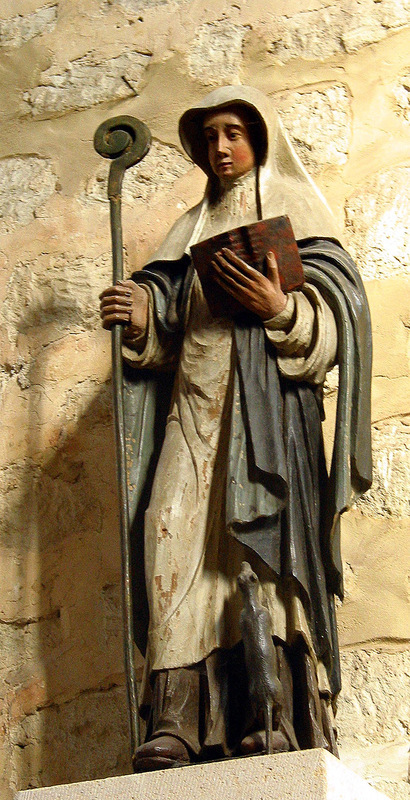 A cat petitions St. Gertrude in this statue located in the saint’s hometown of Nivelles, Belgium. Photo by Wikimedia Commons / Jean-Pol Grandmont. With her agricultural connections, nice weather on March 17 (Gertrude’s feast day) indicates it is time to plant the crops, unlike Groundhog Day, when sunny skies dictate six more weeks of crappy weather. Her patronage of gardeners and herbalists also extends to growers of catmint and cat grass, so be sure to call upon Gertrude before planting catnip. Since kitties love to dig in a freshly tilled garden and leave behind their own special fertilizer, perhaps an intercession by St. Gertrude will keep your vegetable patch free of puss poop. So, cat lovers, insane people, and especially crazy cat ladies, the next time you’re trying to cram a reluctant kitty into a carrier for a trip to the vet or you see the neighbor cat scratching around your herb garden preparing to plant something of his own, you can ask St. Gertrude for a little intercession on your behalf. After all, it’s good to have friends in high places. Safeguard my kitties this and each day. Defend them from those who might wish them harm. Keep them at home safe from danger and storm. Instill in me wisdom to care for them well. Pray, fill me with strength never to yell. Protect my sofa from claws and my carpets from pee. Author, adventuress, and cat-rescuer Dusty Rainbolt is the editor-in-chief of AdoptAShelter.com, a shop-to-donate website that benefits animal charities. She’s also vice president of the Cat Writers Association. Her latest book, the paranormal mystery Death Under the Crescent Moon, was released in February. Thanks! This was the best of the dozens of St. Gertrude pages I reviewed yesterday, at least for my particular needs, even though I stumbled on lots of good stuff, including a legitimate 400-page book about religion in the Baltic region that tells of a widespread “Cult of St. Gertrude” with chapels dedicated to her all over the region. Those animals climbing her staff and robes are mice or rats (sometimes both)—she was thought to keep people safe from rodent infestation, which was why her cult spread so vigorously after the Black Death. Unfortunately her patronage of cats began recently, so none of the early depictions have cats in them. As a big fan fan of both cats and all things medieval, with a particular soft spot for St. Benedict and his spiritual progeny, that would really have made my day. Thanks again. My wife and I have been insane (maybe literally) about the 5 cats we raised cradle to grave over the years. And of course the four we have now. See: Alan V. Murray, The Clash of Cultures on the Medieval Baltic Frontier, 2016. Thanks for telling us about St. Gertrude and her patronage of cats! But the famous icon in this post is not St. Gertrude of Nivelles; it’s Julian of Norwich, painted by Robert Lentz. I know this because my husband commissioned it from the artist, and the original hangs in my office. The cat portrait is based on a photo of my late, great MagnifiCat. Very, very cool!! Thanks for letting us know. MEOW! ??? ?